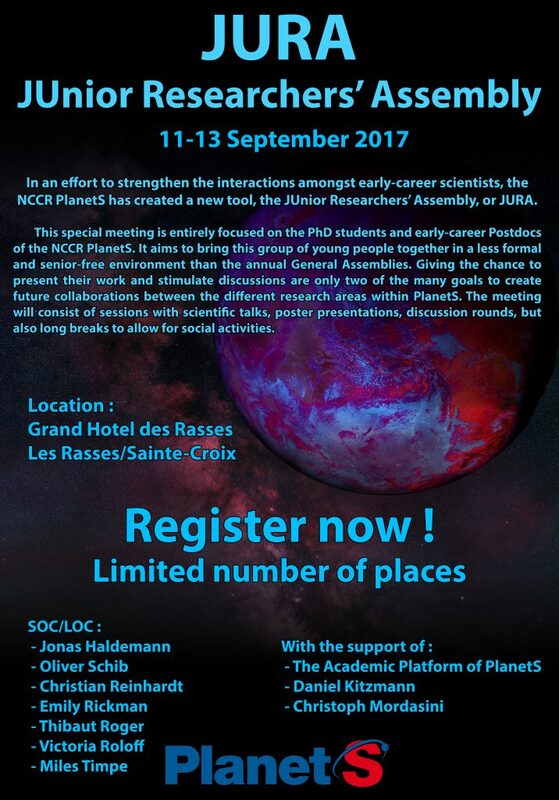 The first PlanetS JUnior Researchers’ Assembly (JURA) will take place on September 11-13, 2017 at the Grand Hôtel des Rasses near Ste-Croix. This special meeting is entirely focused on the PhD students and young Postdocs of the NCCR PlanetS. It aims to bring this group of young people together in a less formal environment than the annual General Assemblies. The goal is to foster interactions between the young researchers of PlanetS, giving them the chance to present their research in a less intimidating setting and to stimulate discussions and potential, future collaborations between the different research areas within PlanetS. The meeting will consist of sessions with scientific talks, poster presentations, discussion rounds but also long breaks to allow for social activities. The retreat is organised by PhD students working at the PlanetS institutions in Bern, Geneva and Zürich and is supported by the PlanetS academic platform. The JUnior Researchers’ Assembly has an upper limit of 35 people, so please complete the registration as soon as possible. If the maximum number of places available is surpassed, a selection process will occur. The hotel is located near the village of Ste-Croix in the canton of Vaud. Built at the end of the 19th century, the Grand Hôtel des Rasses stands at 1,200 metres above sea level in the middle of a park against the backdrop of the long chain of the Alps. The hotel also offers a heated swimming pool as well as a sauna and sports facilities. We will organise the transport of the participants via public transportation or bus. You can also travel by your private car. However, please keep in mind that the expenses for rides with your private car will only be reimbursed (Fr. 0.60 / km) if it’s cheaper than public transportation; e.g. if one participant can transport 2-3 fellow participants to the destination. If you intend to come by car and are willing to offer seats for car sharing, please let us know. The NCCR Academic Platform will cover accommodation and travel expenses for all NCCR members and associates.